The Uffizi Gallery has just announced that it will have a special opening on Monday, October 31st during the long holiday weekend in Italy (for All Saint’s Day on November 1st). Opening hours will be the normal: from 8.15am to 6:50pm, with ticket office closing at 6:05pm and museum starting closing procedures at 6:35pm. 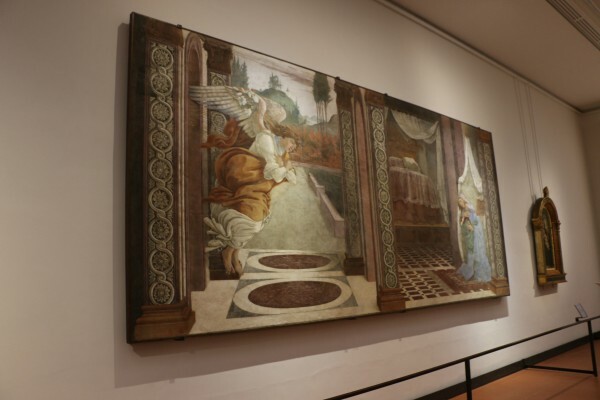 After 15 months of closure, this past Tuesday the Botticelli rooms and the other two rooms dedicated to the Early Renaissance paintings reopened to the public. As part of the New Uffizi project masterminded by the Sopraintendenza Archeologia, Belle Arti e Paessaggio di Firenze which is undertaking the complete renovation of the museum, all without ever closing to the public, the renovation of these last rooms completes the renovation of the entire second floor of the Uffizi Gallery. The reopened rooms were the object of a complete overhaul, with new technological installations governing air conditioning, security and lighting in all of the four rooms. In particular, the Halls 10-14 known as the Botticelli rooms, have been architecturally reconfigured from the ground up with a new false ceiling being constructed and divided into two separate rooms with the use of two full height “theatrical wings” detached from the walls. These wings not only increase the display surface available but also house the air intake ducts and electrical equipment. Thus the rooms are completely free of any other technical installation, giving more space to the works of art on display. 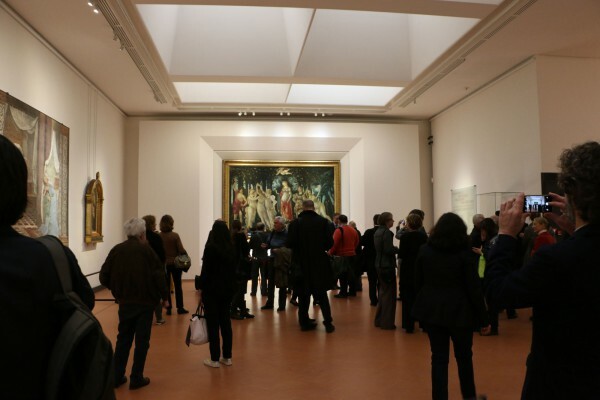 The new layout of the Botticelli rooms will offer visitors the chance to enjoy the paintings on display even when the rooms are considerably crowded by the many groups that gather in front of the most iconic works of art. 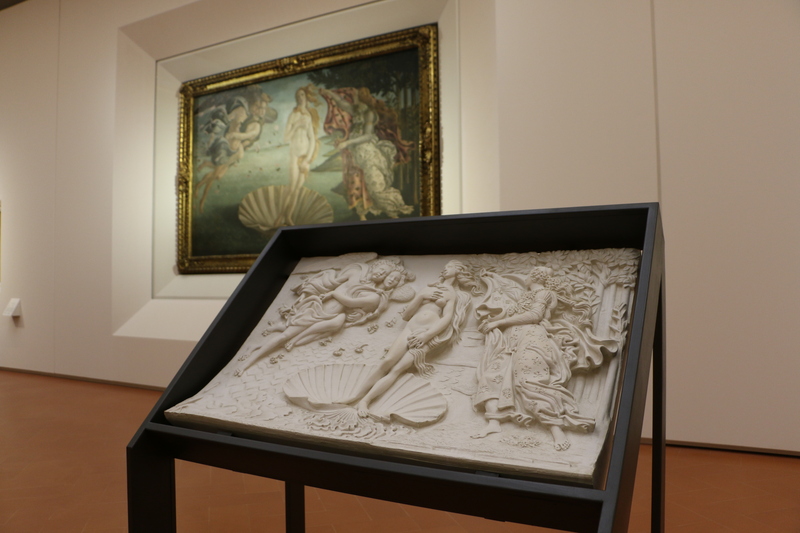 The arrangement of the paintings in the Pollaiolo room (hall 9) has been virtually left the same, but in the two new Botticelli rooms, Spring (La Primavera) and The Birth of Venus have been divided into two focal points and framed. These two celebrated masterpieces have been hung at an appropriate distance from the other works on display so as to make it easier and more convenient for visitors to stop in front of them for longer. The list of Botticelli paintings in display spill beyond the Botticelli rooms — look for two additional Botticelli paintings in Hall 9 – Pollaiolo and two more in Hall 15 – Hugo van der Goes. 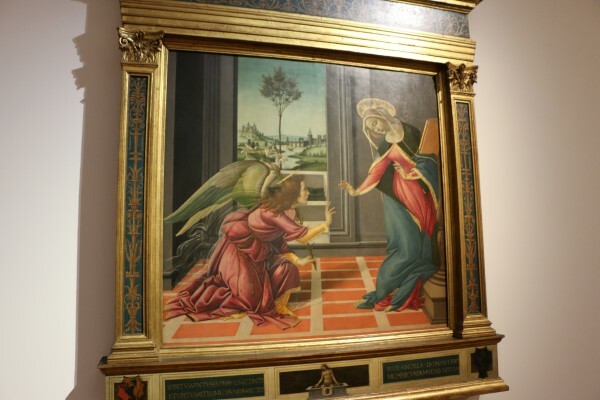 The new arrival of the poetic Annunciation painted for the Hospital of San Martino in Via della Scala in Florence, brings the total of Botticelli works on display to 18. The painting, a fresco almost 6 meters wide painted in 1481 is in the first part of the first Botticelli room, is on the left and in juxtaposition to another painting of another Annunciation, this time on wood, painted by Botticelli for the church of Cestello almost 10 years later (pictured below). At the same time, the Corridors have also had major work done on them, all with new climate appliances and air ducts replaced, the electrical and special systems totally renewed. The new lighting system, composed of state-of-the-art LEDs are now built into a planned management system which allows various light sources to provide indirect, diffused light from the surfaces of the painted vaults as well as direct, constant light on the walls and accent lighting on the sculptures, highlighting the most important pieces. All of these will make a difference in the visitors experience of the Corridors and their collections, without even realizing the difference – unless you know how it was before and look to see the difference. Most notably, The Battle of San Romano by Paolo Uccello has been move from Hall 7 to Hall 8 and the Portraits of the Dukes of Urbino by Piero della Francesca have moved from their central location in Hall 8 to Hall 9 near the windows, where the lighting is soft and permits a clearer viewing of both sides of the paintings. Domenico Veneziano’s Sacred Conversation, known as the Altarpiece of Santa Lucia de’ Magnoli, is also in Hall 8 (moved from hall 7). 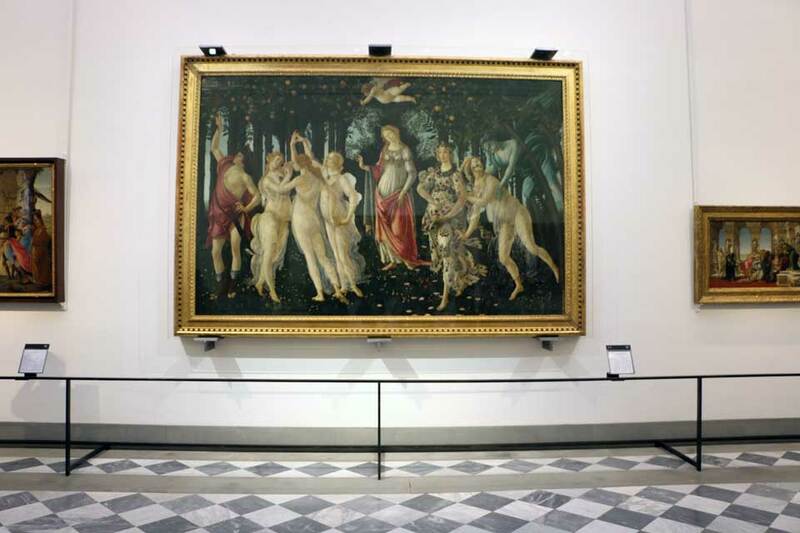 With this latest completion of the renovation project, the Uffizi Gallery has increased its total amount of rooms dedicated to its permanent collections from 45 rooms to 101 rooms! This is due to the conversion of many rooms on the first floor that were being used by the Florence State Archive into new halls for many paintings that were in the Uffizi’s deposits. The construction of the New Uffizi continues, and the Uffizi Gallery should shortly also have especially designed areas in a new zone set aside for temporary exhibitions. With the separation of the permanent museum itinerary from the temporary exhibition area, visitors will finally have a choice whether to visit both or just one. It will also grant the museum more chances to organize and host more exhibitions throughout the year. When computer issues came up at the Uffizi yesterday, there was a bit of a panic! But thank goodness someone remembered they had tucked away unused tickets from the late 1990s and were able to find them to use them as valid receipts by adding the current ticket cost on them. 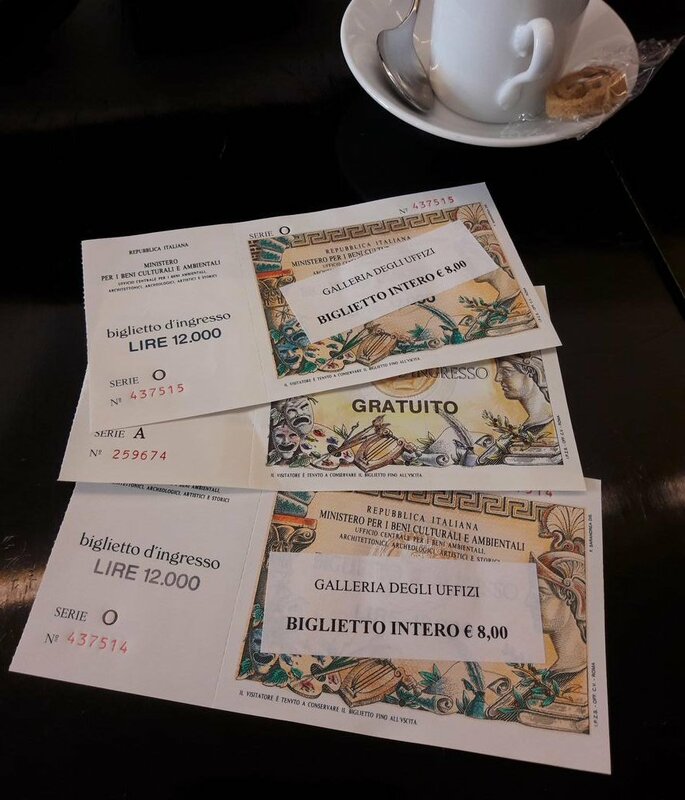 The old tickets still show the cost of lire on them, back when the euro still didn’t exist. 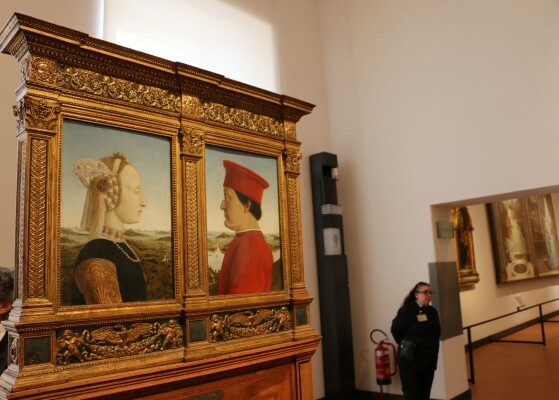 Last year marked the start of major changes at the Uffizi with the arrival of a new director in the second part of the year. Slowly, some changes have been made but many are still to come. 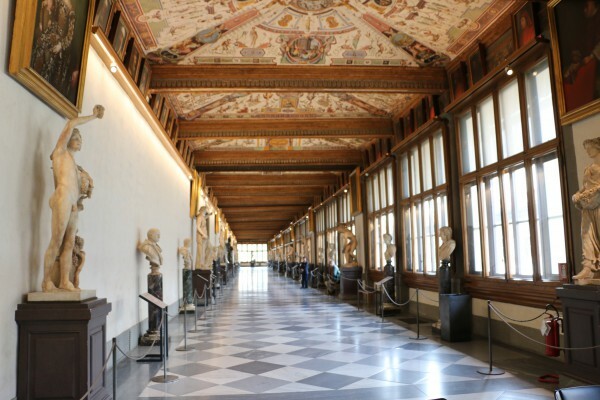 The Vasari Corridor was closed temporarily for a few weeks this summer, only to now be reopen again last week on a very limited basis until the end of November. The popular Tuesday cultural festival “Uffizi Live” continues this August with several repeat performances and new shows. 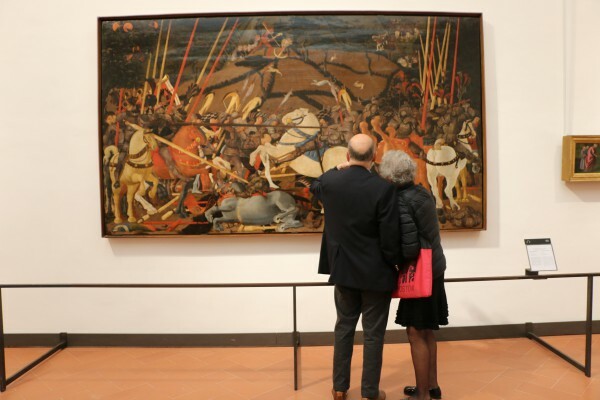 From medieval to classical music, from theater to magic shows, visitors to the museum on these Tuesday evenings will enjoy their cultural experience at the Uffizi with the added art on show! August 2: String female quartet, the “Quartetto Euphoria”, travels across the museum with music related in some way to works of art nearby. Among these, the struggle between Hercules and Nexus with a tango and Vivaldi’s Primavera next to Botticelli’s masterpiece. August 9: Double show with itinerant musicians and mimic performances. Along the corridors, the Mitmacher company presents “The Passion”, a historical reenactment of the route along the streets those condemned to death had to make from the Middle Ages to the first Renaissance as they headed to their own execution. With ambiance music and suggestive dialogue with many references to painters of the time, the young workshop artist that has been “condemned” for the crime of murder. In the Niobe Hall, Federico Bertozzi’s Dummies Project Company will perform a mimic theater dance recalling the episode from Dante’s time of Farinata degli Uberti in “full masks” in contemporary style. August 16: An itinerary between art and musical styles projected by Giovanna Maria Carli in a homage to Mozart in Italy, with a recreation of a violin and harpsichord concert the young genius held in Florence at the Villa of Poggio Imperiale for the Grand Duke of Tuscany, Peter Leopold of the Hapsburg-Lorraine dynasty. August 23: Another double show on this Tuesday, with a commedia dell’arte recital by Roberto Andrioli’s “La Macchina del tuono” using a wide repertory of songs and jokes from the 16-17th centuries from well-known “masks” such as the poor Zanni and stingy Pantalone to the ever cleber Harlequin. 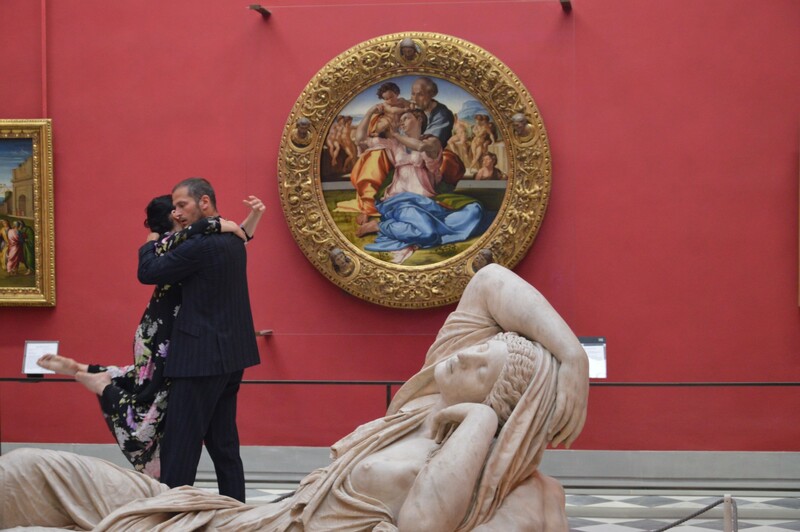 Three separate settings with the Uffizi museum will inspire the international contemporary dance “Inter Pares Project” between movement and static poses inspired by the works and their surroundings spaces. August 30: The month closes with another two performances – Magician Bustric returns as a “night guardian” at the museum and will perform magic numbers between the sculpture and paintings of the museum, while the trio of young musicians/jugglers Bacenetti-Gherardi-Piccioli perform and share their fun “Ball Percussion” project that brings together body percussion, choreographed movements and the able handling of juggling objects. 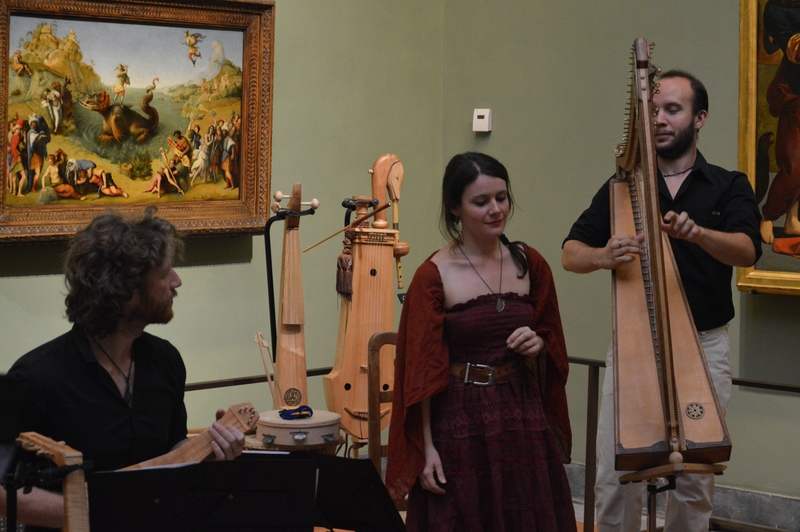 Enjoy your visit to the Uffizi on Tuesdays with the extra performances! Renovation works to completely revamp Halls 10-14, called the Botticelli rooms, have just been completed and a reopening of the Botticelli halls is planned for Tuesday, October 18th. A whole new setting and exposition of the works has been projected. Over the next weeks, the work of preparing the room for the return of the works will be be completed. 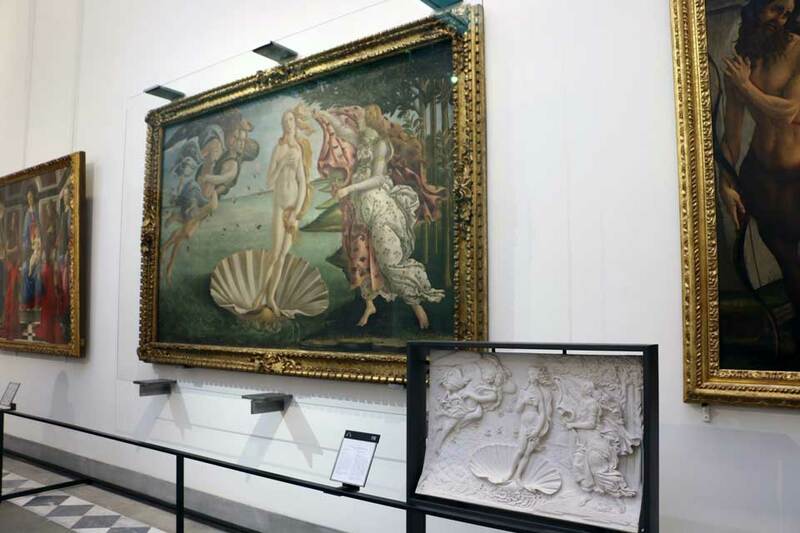 The entire renovation works of these halls, and Hall 41 where Botticelli’s Spring and Birth of Venus have been admired by over 2 million visitors over the last year, were funded by the non-profit organization Friends of Florence. The Uffizi Gallery just announced that it will have a special opening on MONDAY, August 15th, day of the week when the museum is usually closed and this year also a national holiday. On “ferragosto”, the museum will be open with normal hours, from 8.15am to 6.50pm. Last entry that can be reserved will be at 4.45pm. The opening was just announced after the museum leadership reached an agreement for the opening with staff union representatives. 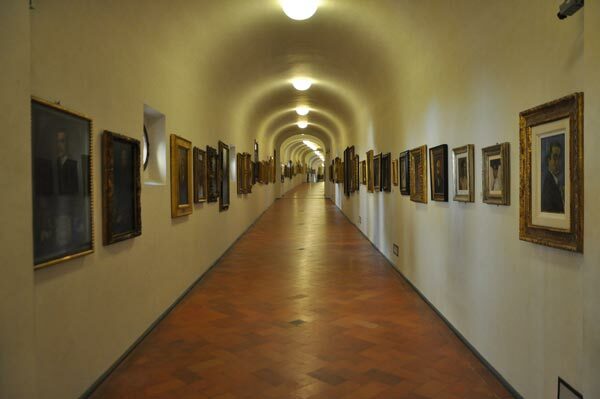 NEWS FLASH: Vasari Corridor Closed! 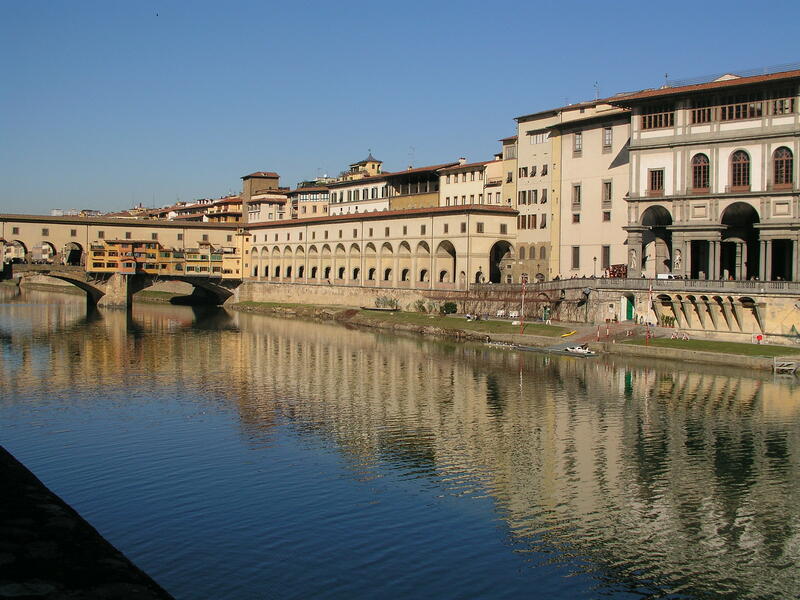 News just sent out by the director’s office of the Gallerie degli Uffizi is that the Vasari Corridor is, effective immediately, closed to visits to all groups. This after an order by the Provincial Command of the Fire Department was issued after an on-site visit by officials of the Fire Department to ascertain the security conditions of the corridor. Details as to what exactly was found lacking were not provided in the news release by the museum. 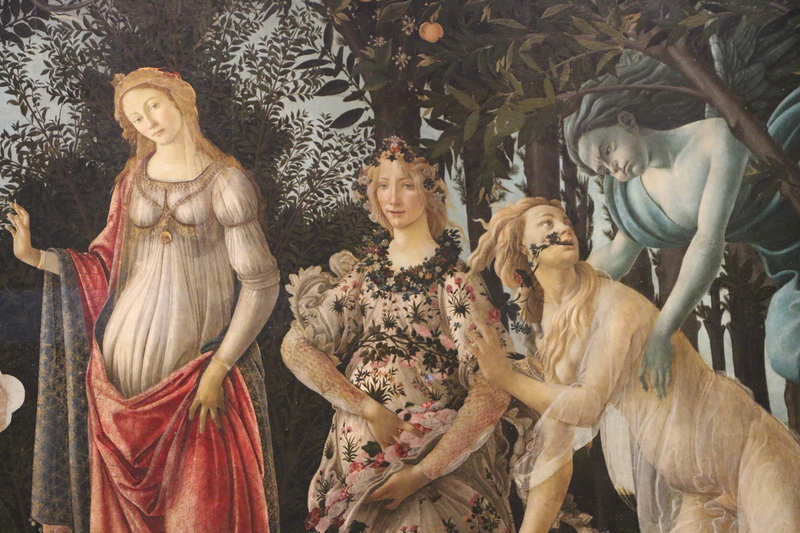 Up until September 27th, the Uffizi Gallery has organized longer openings hours every Tuesday while it offers a Festival of the Performing Arts called “Uffizi Live“. The summer festival includes theater, dance and musical shows and concerts within the Uffizi’s rooms between 7pm and 10pm on these Tuesdays. Visitors will thus have an extra plus to their evening visit at the museum on these days, having a chance to enjoy the pictorial and sculptural artworks of the museum along with other forms of art. The shows range from traditional performances to more contemporary and experimental shows. 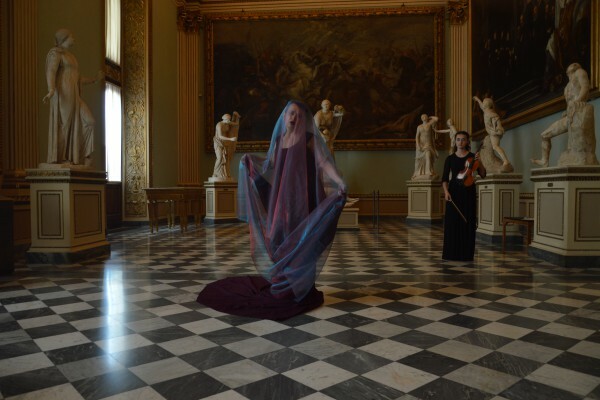 On June 28th, the actress Stefania Stefanin, accompanied by the musical notes of Emma Nicoletti’s violin, re-evoked the Ovidian myth of Niobe and the massacre of her children, the Niobids, in the Hall of the Niobe. The Antica Liuteria Sangineto presents “The depicted sound – musical instruments in the art of painting”, a project that mixes music and art history. The artisans of the Sangineto family will display the faithful reconstructions of ancient string instruments they have handcrafted by copying the original ones featured in paintings within the Gallery. The instruments will thus “relive” and play again, each one next to its depicted replica. July ends with an original and unusual show: a performance of illusion and magic expressly conceived for the artworks of the Uffizi Gallery by Bustric, the Magician. Disguised as an odd night attendant of the museum, Bustric will talk about the artworks while accompanying visitors in a colorful, poetic itinerant tour through the rooms of the Uffizi Gallery. 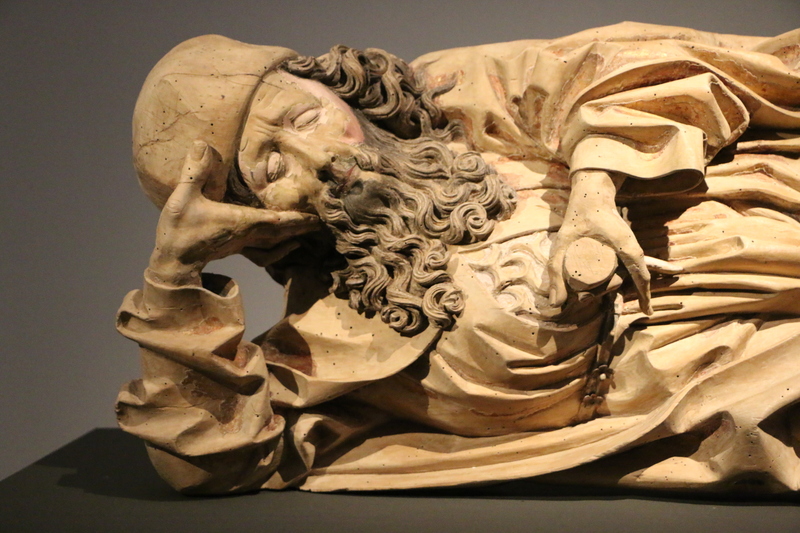 Have you seen that the Uffizi is currently hosting the exhibition dedicated to painted wooden sculpture of the 15th century, called “He Made Sculpture out of Wood and Colored It”? Make sure you stop by during your visit, because it is really quite breathtaking! In addition to a simple stop, if you’re at the museum on Thursdays, you could join in on a guided visit to the exhibit. Every Thursday, in fact, the museum is offering 2 guided visits, at 2pm and 4:30pm. The visits are free with paid admission. All you need to show up at the entrance to the exhibit (at Hall 83 on the first floor) about 10 minutes before. Groups of up to 15 people will then be led into the exhibit together. You can book your spot by calling 055.238.8693 between Tuesday and Saturday, 2:30-4:30pm. If you miss the guided visits, don’t worry but don’t skip the exhibit! It is a once in a lifetime opportunity to see some works up close before they head back to churches and altars.